CATHARINE—The Catharine town board gave unanimous approved for the Humane Society of Schuyler County’s (HSSC) special use permit, Tuesday, Nov. 16, but with several provisions. The special use permit is for the humane society’s proposed new dog shelter on County Route 10 in Alpine. 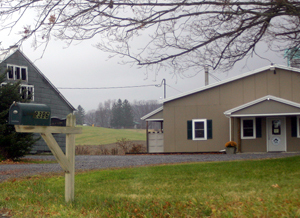 The humane society purchased this property as a new location because the group serves as the county’s animal shelter. While all board members approved the permit, the town still had some concerns about noise. One of the board’s requirements was to move the proposed new structure back to within 50 feet of the rear property line as a way to reduce noise. After the meeting HSSC President Georgie Taylor said this change would increase costs. She explained the original plan was to build an additional structure next to a preexisting one on the property. Both would be used for sheltering dogs and storing supplies and equipment. Taylor said the plan was to join the buildings by a walkway or corridor. What the board wants is for the new building to be built farther back, so it is not in line with the existing building. Taylor said costs would go up if a second alarm system is needed and for snow plowing between the buildings. She added with this change, volunteers would probably walk dogs in the front of the shelter instead of the back. “It won’t be efficient or as streamlined,” said Taylor. Mark Taylor, project manager, said the move would have a small effect on decreasing the noise. He explained moving the building would decrease the noise from 1.3 decibels to 1 decibel. Taylor added people don’t perceive changes in noise when it is less than five decibels. The board also wants the humane society to provide the town with its financial and management plans. Catharine Supervisor John VanSoest said this way the board can make sure the HSSC follows its plans to reduce noise. He added any changes to the shelter’s footprint, height, number of animals, or species of animals helped, must be approved by the board. VanSoest explained all the changes make the project “more palpable” to the board. The proposed shelter must now go before the county planning board, as the project is on a county road. Taylor said the society might be on the planning board’s agenda next month or in January. She added the project is already behind schedule, with work originally planned to start by the end of this year. Taylor explained the initial project cost was estimated as $350,000, but may be as high as $400,000.